What are the high field strength and large ion lithophile (HFS or HFSE & LIL or LILE) elements? There are two groups of elements that are frequently mentioned when discussing incompatible trace elements. They are the high field strength elements (HFS or HFSE) and the large ion lithophile elements (LIL or LILE). What are these groups? How are they used in geochemistry and petrology? The Earth's mantle is mostly composed of the minerals olivine, pyroxene, anorthite, spinel and garnet. These minerals are made from the elements Si, Al, Fe, Mg and Ca. In the figure below I've put them in the MRFE field (Mantle Rock Forming Elements). The trace elements, the elements that occur in very low concentrations, do not form their own minerals and instead are incorporated into the crystal lattice of the common minerals. This is easy in the case elements that share the radius and charge with the major elements because they can easily fit into the crystal lattice (for example Ni in olivine, Cr in clinopyroxene). 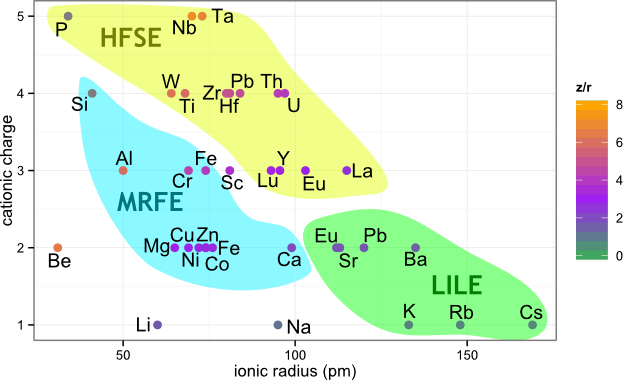 Most elements, however, plot out of the MRFE field in the figure and are considered incompatible elements. That is, in the case of mantle melting, these incompatible elements are partitioned to the magma and eventually migrate with it when it goes to form new rocks (for example basalts). Because different processes and conditions of mantle melting result in different patterns and contents of incompatible elements in the new rocks, we can learn about the mantle melting process by studying these elements in more accessible rocks (such as basalts in volcanoes). Note that I am referring to incompatible elements as incompatible with respect to mantle minerals. In some crustal rocks K, Na and Ti become major elements. In that case the MRFE should be renamed CRFE (Crustal Rock Forming Elements) and expanded to include these elements as well. The incompatible elements are then subdivided into two groups: the high field strength elements (HFS or HFSE) and the large ion lithophile elements (LIL or LILE). The LIL name partly gives away why they are called like that: the LIL are indeed larger than other cations. They are lithophile in the sense that they are incompatible and usually end up enriched in the crust (also lithosphere). The HFS are also enriched in the crust (eventually) but their name derives from their small radius compared to their high cationic charge: the z/r ratio. As a result, their bonding to nearby anions is very strong, that is - they have a high electrical field strength. The subdivision between the two groups has been defined at z/r = 2.0, but as this is a continuous value, no strict theoretical definition of where the boundary lies can be given. Historically, the REE have been considered as LIL. In more modern times, the REE may be excluded when discussing HFS. Why do we need the two groups? Even though both the LILE and HFSE behave in an incompatible way during mantle melting, their response to post-magmatic processes differ. The HFSE are usually immobile: that is, they are mostly resistant to metamorphism and hydrothermal alteration. On the other hand, the LILE are fluid-mobile and hydrothermal alteration may change their contents in the studied rock. Fresh rocks are a scarce luxury and many rocks that we study have experienced some kind of alteration. Because HFSE are resistant to these processes, their contents are likely to be representative of the original rock. This is extremely important: it is possible to look at a rock beyond the altered mineral composition and the modified major element contents. The LIL can teach us the opposite - we can learn about the alteration processes. If we do find fresh rocks and we find anomalies in the LIL systematics, we can learn about hydrothermal processes that occurred in the mantle that would otherwise not be able to see. One would think that hexavalent cations such as Mo6+, Cr6+, V6+ and U6+ should also appear in the figure as cations with an even more HFS character. However, when in the hexavalent state they form anionic complexes and do not behave like the cations in the figure. Not the answer you're looking for? Browse other questions tagged geology volcanology geochemistry mineralogy petrology or ask your own question. Does Earth's magnetic field arise from a fission reactor in its core? What was the likely composition of Earth's early crust (how did crustal composition evolve)? Why is uranium only in the crust, really? What is the CI chondrite concentration of REEs/rare metals, in ppm/grams per ton? Why do gold deposits form only in certain areas of the earth? Why are titanium oxides lumped in with magnetite for the purposes of analyzing water bubble nucleation? How is abundance of elements in the Earth's crust estimated? Definitive values that classifies a rock as having “low”, “medium”, and “high” -strength, -hardness, -toughness, and -consolidation? Ions & elements, which is the correct terminology to use when discussing chemical compounds in Earth Science? Are there minerals which are not been found on earth but which are still possible to exist? What controls the tendency of trace elements in different particle size fractions? What are the cubic formations found inside Larimar gemstones?